Yatra Republic Day Offers are Back Again With Exclusive Deals On Hotels &Flight Tickets. They Are Offering Upto 70% Discount on Domestic Hotel Booking. You Can Avail Upto Rs 10000 Off On International Flights &Upto 1000 Off On Domestic Flight Ticket. This Republic Sale Will Be Run Until 25th Of January 2017. Redeem 10% eCash (up to Rs.1,000) from your Yatra account. Earn 40% eCash upto a maximum of Rs.2,000 eCash. On successful validation of the promo code and completion of transaction,your Yatra account will be credited instantly with the relevant eCash. It is advisable to make this transaction after having logged into your Yatra account. In case of non-logged in transactions,the eCash will be credited to your account,basis the email ID used. You can access the Yatra account by the link sent on your email ID. Use your eCash to make online transactions on flight,domestic hotel and bus bookings. 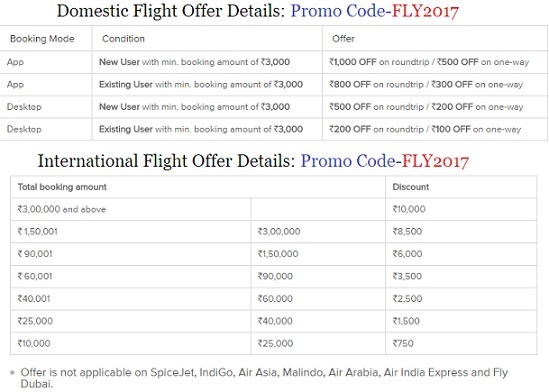 Only 5% of your booking amount can be redeemed via the eCash earned from previous bookings on flights,10% (up to Rs.1,000) on hotels and 10% each on bus and train bookings.